BACK in July students at Frome college held a fundraising mufti day. The total raised was then split between three charities. 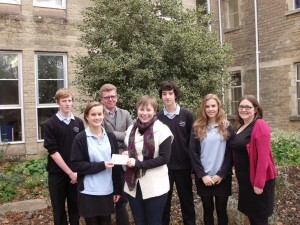 Last week PAC fundraiser Kelly Hall went to the college to collect a cheque for £249. PAC offer a service for young people based at Frome College which is open to anyone affected or bereaved by cancer and other life threatening illnesses. The money raised by pupils will be used to support the service run at the college.